Easter is family time. College students often return home, grandparents stop by, aunts and uncles come over for Sunday meal. Not surprisingly, it is also a time to take the family portrait. So, with all this family time, is there an Easter gift that everyone can enjoy? Chocolate Pizza is quickly becoming a gift-of-choice for this family holiday. But, not just any Chocolate Pizza. 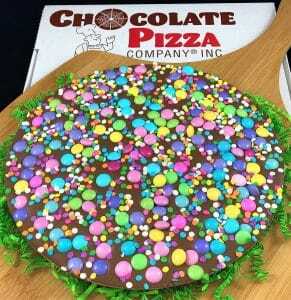 The fact is that only one company has earned a federal trademark for “Chocolate Pizza.” Chocolate Pizza Company is Central New York’s largest chocolate maker and the trademark owner for this unique confection. The famous circle-R symbol means our Chocolate Pizza is recognized as distinctive in the marketplace. Of course, Chocolate Pizza is just one of our many gourmet specialties. 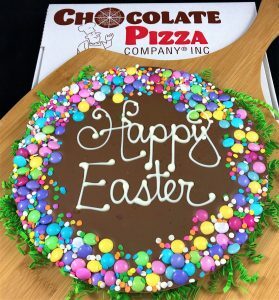 Chocolate Pizza Company creates Easter treats that are creative, fun and delicious. We make all the traditional solid chocolate bunnies, chocolate dipped Peeps, and beautiful swirled chocolate Easter eggs. Likewise, there are gift baskets filled with Peanut Butter Wings, caramel and nut Drumsticks, chocolate covered cookies and more. But, the best Easter gift for the entire family is a handcrafted Chocolate Pizza. Chocolate Pizza starts with the highest quality Swiss-style chocolate. Higher in milk content and slightly sweeter, Swiss-style chocolate is extremely popular. Quality chocolate must be tempered to bring out its best characteristics. Chocolatiers temper the chocolate by manipulating temperature during melting. It is a very precise process. Tempered chocolate has a distinct snap, shine and smooth mouth-feel. Once tempered, chocolate spins in large temperature-controlled stainless-steel bowls. 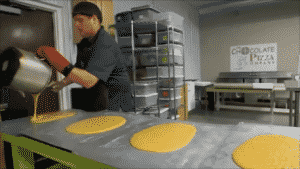 Next, chocolatiers add something special to the tempered chocolate. English toffee joins the party. Chocolate Pizza Company owner, Ryan Novak, makes the toffee on-site, in small batches. He uses a local recipe that over 100 years old. The aroma of bubbling toffee is amazing. But, the process is dangerous as the toffee hits 280 degrees before it turns a beautiful golden color. Ryan pours out the toffee on baking sheets to cool. Finally, it is broken into pieces, ground fine, and added to the melted chocolate. The toffee adds texture and a note of sweetness. Chocolatiers can now create a Chocolate Pizza. First, the blended chocolate and toffee mixture is poured into actual pizza pans. Second, the pans take a quick trip on a shaker-table where air bubbles are released. Third, it is time for some toppings. 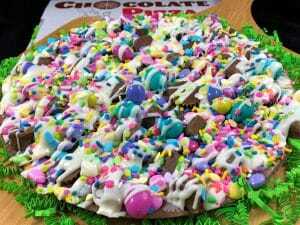 Chocolate Pizza Company makes three seasonal Chocolate Pizza favorites for Easter. First, there is the “Celebrate Spring” Chocolate Pizza. Next, there is the “Happy Easter” Chocolate Pizza. Finally, the supreme pizza version is called, Easter Avalanche Chocolate Pizza. Celebrate Spring is the perfect way to describe this festive Chocolate Pizza. Chocolatiers cover this Chocolate Pizza with pastel colored chocolate gems and sugar confetti. Customers can choose milk or dark versions. Celebrate Spring weighs in at 16 ounces for a regular and 28 ounces for a large. It is sealed in clear cellophane and served in a custom pizza box. “Happy Easter” Chocolate Pizza takes its cues from it cousin, Celebrate Spring. It uses the same beautiful mixture of pastel chocolate gems and sugar confetti to create a border. Chocolatiers hand-script, Happy Easter, in white chocolate. Similarly, this Chocolate Pizza comes in milk or dark chocolate and is sealed in cellophane. Likewise, it comes served in a custom pizza box for fun. But the granddaddy of family-friendly Chocolate Pizzas is the Easter Avalanche. You need two hands to pick up nearly two pounds of milk chocolate. Toppings for this behemoth start with pastel chocolate gems and peanut butter cups. But then, it adds candy bar pieces and sugar confetti. Finally, white chocolate drizzle finishes the look. If an Easter basket were a Chocolate Pizza, then it would be an Easter Avalanche. As a result, it feeds a big family or small army. Chocolate Pizza is fun for the whole family on Easter. It makes a wonderful centerpiece for the dinner table. And, everyone will want their picture taken with it before it is devoured. Chocolate Pizza Company is located in the Finger Lakes region of Upstate New York. Ryan started with the company as a dishwasher at the age of 15. By age 21, he was the owner. His vision was to transform a small-town chocolate shop into an emerging national brand. Certainly, national media has taken notice. Company features include Food Network, Hallmark Channel, CNBC, and CMT. Also, Ryan has also been interviewed in Forbes, People, and Entrepreneur magazines. Chocolate Pizza Company creates gourmet chocolate gifts for holidays, birthdays, weddings and special occasions. Its website, ChocolatePizza.com, has received orders from 6 continents.